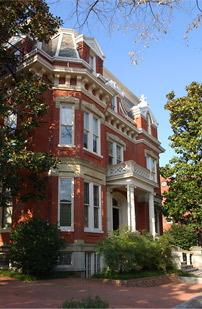 VCU’s Founders Hall, site of “Belles Gone Bad,” April 26 – May 24, 827 W. Franklin St., Richmond, VA.
April 26 – May 24 found me revisiting some of my favorite writers—including Flannery O’Connor, Katherine Anne Porter, and Eudora Welty—with the women enrolled in Belles Gone Bad, a course that I developed for the Commonwealth Society, VCU’s institute for lifelong learning. Elisabeth “Betsy” Muhlenfeld, president emerita of Sweet Briar College (1996 – 2009) and Mary Boykin Chesnut scholar, joined the class for our final Tuesday-morning meeting on May 24. Her remarks on Chesnut brought to life a woman whose incisive diary, Mary Chesnut’s Civil War, offers not only one of the most important historical accounts of the Civil War years but also a document of considerable literary merit. Muhlenfeld’s biography of Chesnut sustained me while I was icing a sprained ankle back in March and renewed my interest in the diarist, so I added Muhlenfeld’s edition of Chesnut’s novel manuscripts (UVA Press, 2002) to my summer reading list. Chesnut’s unfinished apprentice novels, The Captain and the Colonel and Two Years—or The Way We Lived Then, don’t place you in her world the way her diary so beautifully does, but they reveal how she fictionalized her life as she taught herself to write, and in her developing voice you can hear a hint of what’s to come. Other notable summer reads include the first chapter of colleague Mary Lou Hall’s Dogs and Heroes, which received the third annual Best Unpublished Novel prize, sponsored by James River Writers and Richmond Magazine. Mary Lou read the opening of the novel at the Focused Inquiry Faculty symposium on Friday, November 12, and I enjoyed reacquainting myself with the first chapter–in the pages of the July issue of RM–which introduces a boy named Clarence and his new friend Mona, the albino Great Dane “all white with the baby blue eyes” (66). Congratulations, Mary Lou! Still lingering in my mind is the closing image of the writer learning to dance in the personal essay “Lady Lessons” by Lee Smith in the June/July issue of Garden and Gun. Studying with Smith in 1989 filled me with the love that Bobbie’s dancing lesson gives the young Lee. And her writing continues to delight and instruct me.